While we’re watching the scandals, Trump is dismantling the federal government. While we’re watching the scandals du jour, the president and his top advisers are dismantling the federal government. 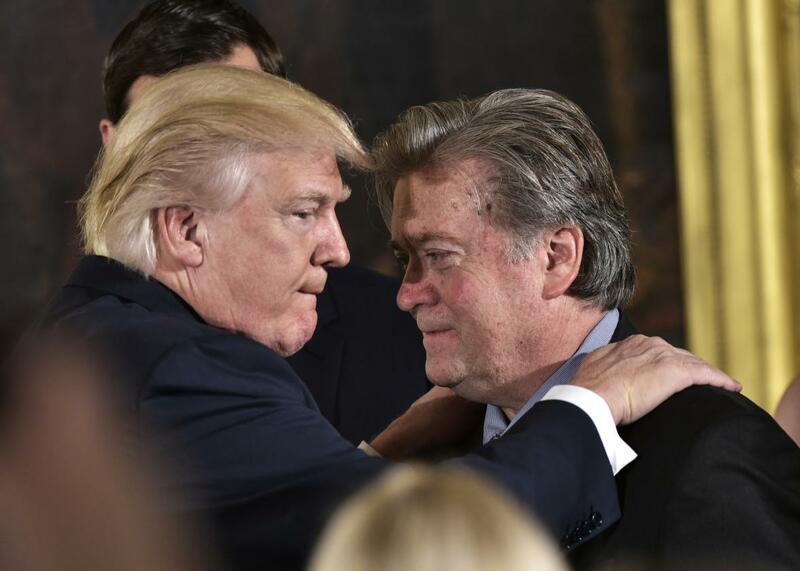 President Trump congratulates his strategist Stephen Bannon during the swearing-in of senior staff in the East Room of the White House on Jan. 22 in Washington, D.C. This week, President Trump delighted his base with a pledge to treat deportations like a “military operation.” There were also reports that his administration is urging government officials to cherry-pick intelligence to support their desired policy outcomes and that his White House chief of staff made inappropriate contact with the FBI regarding Trump’s Russia ties. And that’s just the news from the national security sphere. The rage felt by the president’s critics is real, and understandable, but it also plays into Trump’s broader agenda. His chief strategist Steve Bannon outlined that strategy this week at the Conservative Political Action Conference, describing it as nothing less than the “deconstruction of the administrative state.” Bannon’s comments this week suggest a darker, more nefarious purpose to the nascent Trump administration’s dysfunction. It may be the case that the Trump team is deliberately failing to staff, manage, and provide resources for federal agencies so as to sabotage and slowly dismantle them. To make matters worse, the Trump team might be leveraging the controversies regarding its disastrous national security moves to obscure and conceal that slow and steady demolition of the bureaucracy. After the election, the administration was slow to deploy its transition teams, pick top officials, develop future budgets, and generally take the reins of government. By almost any measure, the Trump White House lagged behind prior transitions in these efforts—it was the dog that caught the car and didn’t know what to do next. To this day, the Trump administration lags in terms of picking its political appointees, let alone articulating a comprehensive policy agenda that goes much beyond “make America great again.” At the Departments of Defense and Veterans Affairs, the two largest federal agencies by budget and headcount, the Trump imprint on policy remains amazingly light. One can glean more about acquisition, health care, or war-making from presidential tweets than from the White House’s website. Federal agencies require certain commodities to run: leadership, legislative authorization, funding, and people. The combination of these commodities results in programming, executed either by government employees, contractors, or local governments using federal grant funds. Every part of this formula has been neglected by the Trump administration. As of this writing, the Trump administration has failed to announce its picks for deputy, undersecretary, and assistant secretary positions across government, let alone to submit those nominations to the Senate for confirmation. Political personnel appointments are, as the old saying goes, a form of policy. These administration appointees are the actual executors of any administration’s agenda. They are the ones whose orders, directives, and oversight provide guidance to millions of federal employees and contractors. The officials the Trump administration has appointed include personnel whose résumés are extraordinarily thin on governance experience and who are hostile to the government itself. Dr. Ben Carson, the former presidential candidate who is now leading the Department of Housing and Urban Development, has never worked in government. Neither has Education Secretary Betsy DeVos, whose donations have funded an anti-federal agenda for years. One appointee, Gov. Rick Perry, has plenty of public sector experience, but he previously took the position that his future agency (the Department of Energy) ought to be wiped off the map. Beyond leaders, agencies need congressional authorization and funding to function. And yet, because the agencies lack political leaders beyond the midlevel transition teams deployed after the inauguration, they are woefully behind in preparing budgets for President Trump to submit to Congress. In years past, Presidents Bush and Obama submitted their budgets within a few weeks of taking office, thanks to Herculean amounts of work by their transition teams to develop detailed fiscal plans. These teams understood that the budget submission was the key to execution of their policy agenda. It’s possible that the Trump team doesn’t understand that linkage between funding and policy. It’s also possible the Trump team doesn’t care if agencies get new budgets because its ultimate goal is to starve these agencies. If Congress continues to pass continuing resolutions that freeze funding at current levels, while the White House’s hiring and regulatory freezes remain in place, federal agencies will begin to shrink by attrition. Agencies need people to do their jobs. The government is staffed by 2.6 million federal civilian and 1.4 million uniformed employees. Most new leaders would look for opportunities to engage their workforce and enlist them in their agenda. Not Trump, who has instead opted to attack parts of the federal workforce (like the intelligence community) while holding political rallies before others (the CIA and troops). Trump’s hiring freeze has signaled disdain to the federal civilian workforce, as have many of his Cabinet picks and congressional allies, who have continued to rail against the scourge of bureaucracy and bureaucrats. Each of these forms of neglect advances the Bannon/Trump agenda of crippling the federal government. Unfortunately, we’re too busy paying attention to Russian intrigues, presidential conflicts of interest, and unconstitutional immigration policies to notice that the Trump team has already started its campaign to undo the state that has evolved since the New Deal to serve the American people. We cannot ignore the scandals du jour. The Trump administration’s Russia ties represent a threat to national security and the rule of law; its immigration order threatens to tear apart the constitutional fabric that binds us together. However, we must see these scandals in context and stop Trump from leveraging our distraction to disassemble the government in front of our eyes.